Up next were the All-Stars vs the Vanuatu Volcanoes. Known for their speed and aggression at ground level, the Volcanoes got off to a fast start in what ended up being a low-scoring affair at Albert Park. The All-Stars attempted to mount a comeback, but it wasn’t meant to be, with Vanuatu’s side prevailing 3.3.21 to 1.3.9 to start their cup off with a win. Eddie Tom was named best on ground, while the Lop brothers - Eddie and Sandy - both hit the scoreboard for goals. The final match of the day was the hotly-anticipated contest between the Tribe and the Volcanoes. While the Volcanoes had some nice possessions early on, they weren’t able to get enough inside-50s to have a crack at goal. The Tribe went in at the halftime break up by only two goals, however, leaving the door open for a Vanuatu comeback. 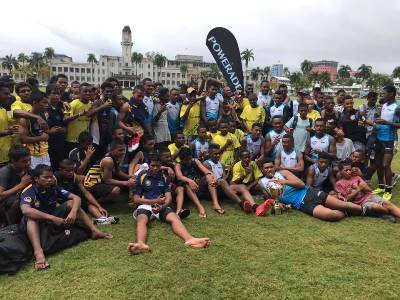 However, the Fijians used a three-goal flurry in the opening minutes of the second half to put the game out of reach, winning 5.7.35 to 0.3.3 and taking home the lightning cup trophy. Naibuka Ladiniwasi was named BOG for the victors. The real fun started the following morning, when the Oceania Cup officially got under way. Having warmed up with the lightning matches, all four sides were itching for the real deal. Game one was a rematch of the Volcanoes and Tribe, and featured some great intensity around the contest. Despite the Tribe holding a distinct height advantage, the Volcanoes showed their endeavor and pace all around the ground. However, Fiji managed to tip the scale in their favor on the inside-50s, resulting in several goals and building a nice lead. Rabuka starred with three goals, while forward Meli Vula had three of his own, and Ladiniwasi earned his second BOG honor of the weekend. Fiji defeated the Volcanoes 6.8.48 to 2.3.15. After sitting out the lightning tourney, the Nauru Stars were excited to get the show on the road against the All-Stars. Despite battling some humid temperatures, the Stars managed to show off their outstanding skills and ball pressure, cruising out to a big lead which they would not relinquish. Nauru took home their first win of the cup by a score of 14.6.90 to 1.0.6. Tsunami Kepea led the way with four majors. Game three was the All-Stars vs the Tribe, and the All-Stars had their best performance yet, going blow for blow with the hosts and keeping it very competitive through the first three quarters. Unfortunately, the more experienced Tribe booted two key goals in the final quarter and escaped with a 5.7.37 to 3.2.20 win. The main attraction on December 5th was the first contest between Nauru and Vanuatu. The Volcanoes came out hot, using their midfield pressure to force the Stars into some bad decisions, but it wasn’t long before they shook off the cobwebs and started clicking. The second half was all in the Stars’ favor as they finished with a four-goal flurry that put the match out of reach, 7.9.51 to 1.3.9. Key playmakers for the Stars were the Hubert brothers, Smartt and Samson, the latter of whom was named BOG. The day also included a successful presentation by the Fiji Ministry of Health focused on encouraging good diet habits among young athletes. Up next were the Tribe and the Stars in a matchup of the most experienced sides in the tourney. The Tribe were hot right out of the gates and kept it up until halftime, by which point they still had a one goal lead. The boys from Fiji were able to keep up the hard work as the game progressed and ended up with a very solid win, 6.5.41 to 3.5.25. The Volcanoes were eager to redeem themselves against the All-Stars after falling earlier in the day to Nauru, and they certainly made a statement, winning 10.4.63 to 0.5.5. The Volcanoes used the footy intelligently all game (despite a goalless third quarter) and were led by the exciting Kieron Meake (four goals). The final day of the Oceania Cup started off with the #3 vs #4 seed consolation game between the Volcanoes and the All-Stars, who were both hungry to head home with a win. Both teams fought hard, but in the end, Vanuatu finished strong, winning by four goals and finishing in third place at the tourney. Finally, the Grand Final between the Fiji Tribe and the Nauru Stars, which could rival any GF in terms of excitement and passion. Defense was the star of the show in the first half, with both teams only managing a goal apiece. However, the second half began with a bang, and the Tribe took advantage, securing a three-goal lead by three-quarter time, and the Stars couldn’t manage a comeback. Ultimately, the Tribe successfully defended their Oceania Cup title and also may have booked a few trips to Queensland in March for the AFL South Pacific Talent Competition, which will have several spots open for deserving international players. In addition to AFL Fiji, AFL Nauru, and AFL Vanuatu, the Oceania Cup wouldn’t be possible without the huge support of the Fiji National Sports Commission, who were heavily involved in promoting the tournament. The future of Aussie rules in the South Pacific continues to look very bright indeed.